Ever wondered how beer is made? 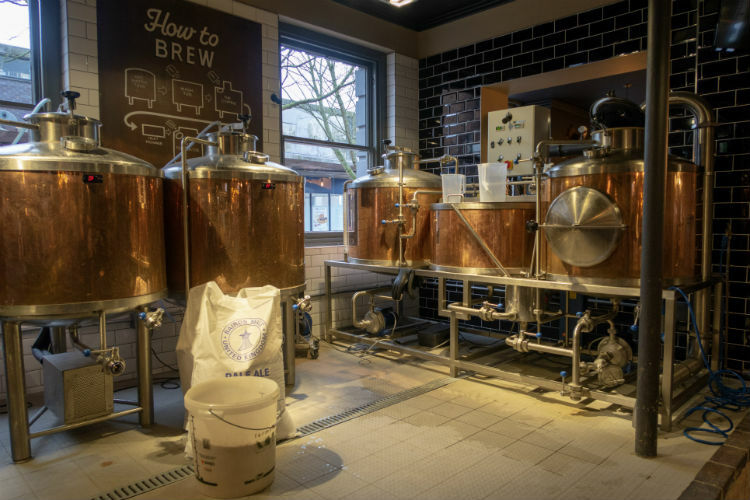 Whether you’re a keen home brewer or just like drinking beer, you’ll enjoy a Brew Day Experience at a Brewhouse & Kitchen pub. I was recently invited to spend a day in the microbrewery at the Brewhouse & Kitchen in Lichfield with Gabriele Vanzo, the pub’s head brewer. Mark came along for the day as well, and together we helped Gabriele to start off a batch of Spellman Sam pale ale. The Brewhouse & Kitchen Lichfield is a pub and restaurant which matches food with a wide range of beers. They serve bottled and draught beers and lagers, and have options suitable for vegan and gluten-free diets. Click here to find your nearest Brewhouse & Kitchen pub. The process starts off by adding malt to very hot water in a large vat called the mash tun. To make sure that every grain comes into contact with the hot water, it has to be mixed together thoroughly. Mark took on this job, and it was certainly a good workout for him! The hot water helps to break down the complex carbohydrates in the grain, which turns them into sugar. The air was soon filled with a rich, sweet, malty smell. This part of the process takes a while, so we stopped for breakfast. Mark and I both enjoyed a soft beer sourdough roll filled with thick slices of really good bacon. The Brewhouse & Kitchen has a great brunch menu which is available til 2pm, and you can also add bottomless Mimosas for an additional charge. After my delicious breakfast and a good strong cup of coffee, Gabriele took us over to the bar to show us the range of beers which they brew on site in the microbrewery. As I’ve mentioned in my recent review of the Brewhouse & Kitchen, the pub has a wide range of beers to choose from. This includes a number of cask and keg beers which they brew in their own microbrewery. Some of the range are permanent fixtures, and some are special editions available for a limited time. For example, the Mimosa pale ale was brewed for International Women’s Day. We had a small taste of each of the beers. I really liked the Three Stick American Pale Ale, the Lunartick Red Rye Ale, and the dark, chocolatey Ameliorator Porter. Back over at the mash tun, it was time to filter out any grain that had sunk to the bottom of the liquid. That’s done by siphoning off some of the liquid into a large jug. It is then poured gently back over the spent grain that floats on the top of the mash tun. We were also able to taste the liquid at this point. It tastes very sweet and malty, but not like beer at all. We carefully added more hot water at this stage, to extract every last drop of flavour from the grain. The beer is then transferred over into the large vat on the right of the picture above, which is called the copper. Then the temperature of the beer has to be brought up to 100°C, which takes quite a while. And that made it a good time to take a break for lunch. Mark had a cheese and pickle sandwich, while my sandwich was filled with delicious, thickly sliced roast beef. Then it was time for us to get back to work again. Or more precisely, it was time for Mark to get back to work! All of that spent grain stays in the mash tun, so someone has to clean it all out. Mark set to work on this, clearing out the spent grain and then giving the mash tun a thorough scrub and wash out. When the beer reached 100°C, it was time to add in the first lot of hops. This first addition gives the beer its characteristic bitter flavour. While the hops were doing their thing, Mark and Gabriele sterilised the fermenter, ready to hold the fermenting beer. They also set up the pipe that would carry the beer from the copper into the fermentor. More hops are added to the beer at this stage, to give an aromatic, hoppy flavour. The beer is then transferred over into the fermenter. At this stage we added in activated yeast, to turn the sugar into alcohol. The beer will then sit in the fermenter for a few days, before it is racked and ready to drink. The copper also needs to be cleaned out, ready for the next batch of beer. Mark did a fantastic job of this again, and left the copper spotlessly clean! So after all our hard work (OK, all Mark’s hard work…) it was time to go and enjoy a pint of beer in the pub. The Brew Day Experience is a fantastic way to see what goes on ‘behind the scenes’ at a microbrewery. And I love the fact that all of this goes on in the heart of the pub, so customers can watch the beer-making while they enjoy a pint themselves. Gabriele is also available for regular ‘Meet the Brewer’ sessions to answer your beer-making questions. We were invited to attend as guests of the Brewhouse & Kitchen Lichfield, but ordinarily the Brew Day Experience costs £85 per person. This includes food and drink during the day, a certificate and a 5 litre mini-keg of beer to take home. The experience would make a really unusual and thoughtful gift for a birthday, Christmas or Father’s Day. The Brewhouse & Kitchen’s Academy also offers a Beer Masterclass, where you sample 8 beers with assorted nibbles. There is also a Beer and Food Matching Experience, which matches dishes from the pub’s menu with beers from the microbrewery. Thanks to Tom, the pub’s manager, for inviting us to take part in the Brew Day experience. Thanks also to head brewer Gabriele for a very fun and interesting day. We really enjoyed our visit to the Brewhouse & Kitchen Lichfield, and hope to go back soon to sample ‘our’ batch of beer!